Directions: Located between the intersection of Central and New York Avenues. 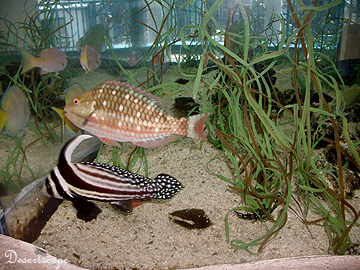 Though smaller in size, the Albuquerque Aquarium was compacted with aquatic floras and faunas from Rio Grande to the Gulf of Mexico. Once entered the Aquarium, the visitors are greeted by a few smaller tanks and pathway that would led to some historical marine artifacts. Following the path, visitor can see a large tank where sting rays of various size swam gracefully to and fore, as part s of their bodies broke the surface of water and gently splash around. 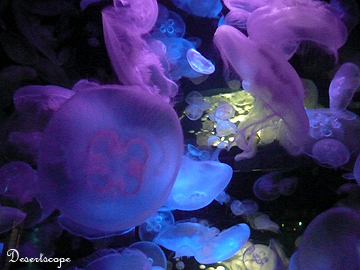 Along with various fishes, one section is dedicated to jellyfish. These creatures suspected in the water, illuminated by dim black light, looked both strange and beautiful at the same time. Follow a trail of tanks of various sizes, visitor would come to a dead stop at the share size of the large tank. Here the large glass window extended from the ceiling to the floor and allow visitors the panoramic view of the nearly 300,000 gallon tank. 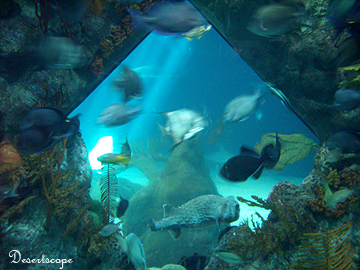 The tank contains sea turtle, sting rays, puff fish, several kinds of sharks, and many other sea creatures. Overall, it normal takes less than a hour to visit the entire place, depending on how long they stood in front of the shark tank. It is charming little place.